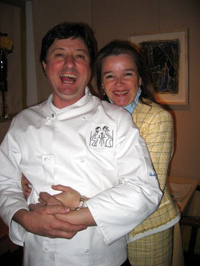 A memorable evening of romance and fine dining at the award-winning Restaurant JEAN-LOUIS in Greenwich, Connecticut owned by Chef Jean-Louis Gerin and his charming wife Linda, had me fondly recalling memories of Paris. Since 1985, Restaurant JEAN-LOUIS has focused on the art and style of French cuisine with the perfect dash of intimate ambience and attentive yet unobtrusive service; located only 37 minutes from New York City, it is well worth the drive. Restaurant JEAN-LOUIS is a treasure, a "bijou" as they would say in France; an intimate restaurant that is as attractive as it is welcoming. 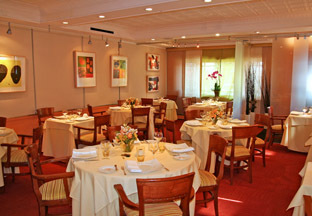 Original art graces the bisque and coral accented walls, and a rich terra cotta wall at the back of the restaurant draws the eye to the Chef-Bar which has 4 stools to provide guests with the opportunity to watch the action in the kitchen where Chef Jean-Louis deftly orchestrates his culinary magic. The dining room tables are pristinely dressed with cream linens and ivory napkins, sparkling crystal wine glasses etched with the name, Jean-Louis Gerin, white on white Bernardaud china, tea lights glow in domed white holders, red glass is artfully scattered to add visual appeal, and specially designed bread plates with the restaurant's charming logo of a man and a woman gazing into one another's eyes across a table that hints that although stylish and elegant, there is a playfulness here as well that accompanies the exquisite cuisine and service. We began the evening sitting at the Chef-Bar and enjoying an aperitif of Jean-Louis' private label champagne, Champagne 1er Cru "Cuvée Jean-Louis" Brut, Blanc de Blancs, chatting with the amiable Chef Jean-Louis about his culinary vision and admiring the large silver toque displayed on the bar. 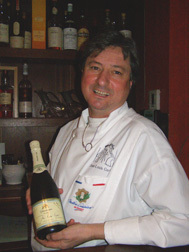 Since Jean-Louis began his foray into the culinary world at age 13 working in a Michelin restaurant where he was responsible for washing the Baccarat crystal, and after his preliminary education, graduating from the prestigious l'Ecole Hôtelière de Thonon Les Bains in France where he received formal restaurant training and a degree in business, his culinary dedication has earned him numerous awards and recognition including Maitre Cuisiner de France - Chevalier du Mérite Agricole 2001 (Master Chef of France); Best Chef Northeast "James Beard Foundation 2006; and The Silver Toque, Master Chef of France 2009. Chef Jean-Louis knows how to earn guest loyalty with his flexible approach to dining that includes a 5-course menu, Le Grand Tasting, which he changes nightly; a 3-course menu, La Ballade Gourmande; an a la carte menu; and for guests looking for something smaller, there is a special menu with mini-prices at the Chef-Bar. 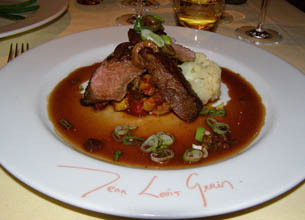 However, to fully appreciate his style, we opted to have the 5-course Le Grand Tasting menu. Comfortably seated at a table by the window, we eagerly anticipated what surprises were in store for us while music by Billie Holiday played softly in the background. 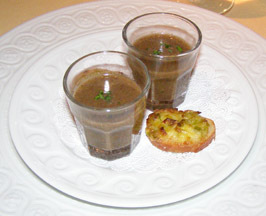 The first inspiration of the evening to arrive was a well presented and very tasty amuse bouche of a rich and flavorful mushroom soup served in a shot glass accompanied by a leek tartlet that set the standard for the evening. 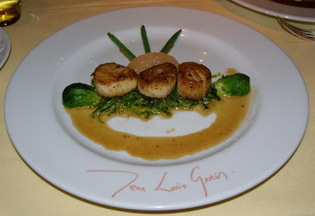 Although we both had Le Grand Tasting Menus, Chef Jean-Louis created separate menus for each of us. 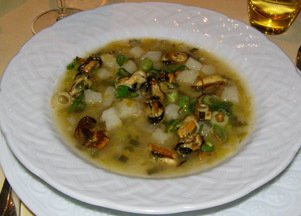 For Edward, there was a lovely first course of vichyssoise made with cubed potatoes, leeks, and a generous amount of mussels in a flavorful broth. This hearty course was definitely a palate pleaser and was perfect on a cold and rainy evening. 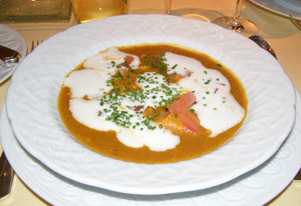 For my first course there was delicious pumpkin and lobster bisque that was swirled with a pool of crème fraiche and garnished with diced tomatoes and micro chives scattered along the top. The bisque had great subtly of flavors that melded together beautifully and offered succulent lobster morsels in each spoonful. Both of our first courses were well paired with Côtes du Rhône 2008, Ferraton Père & Fils, 13% alcohol, from the Rhone Valley. 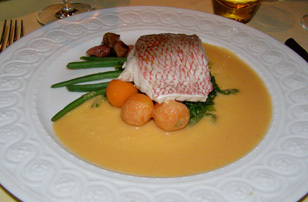 Edward continued with red snapper that was steamed in jus with fresh ginger and was elegantly presented on a bed of seaweed salad, and accompanied by carrot balls and haricot vert in a beurre blanc sauce (Filet de Vivaneaux à la vapeur de gingembre, salade d'algues et de haricot vert, beurre blanc). Chef Jean-Louis clearly demonstrated his expertise with recipes that were not overcomplicated, yet were enchanting in the selection and combination of ingredients and flavors. 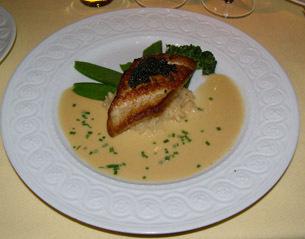 For my next tasting, Chef Jean-Louis sent me a buttery and golden crispy skin sole that was crowned with caviar and presented on a bed of risotto with a fan of snow peas and a broccoli floweret with a pool of sauce sprinkled with micro chives. As someone who appreciates caviar, this course was sensational, fully delivering on the palate what it promised in the presentation. Our courses were once again expertly paired, this time with Chateau La Grand Clotte 2005, Bordeaux Blanc, 14% alcohol, that was fermented and aged in new French oak barrels. 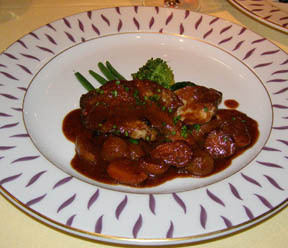 Edward's third course was slices of tenderloin presented on a mound of ratatouille, with cranberries, nicoise olives, cauliflower, and snow peas in a rich sauce. This course was paired with Joseph Drouhin, Chorey-Les-Beaune, 13% alcohol, from Burgundy that was aromatic with rich dark fruit on the palate. My third course was scallops that were pan seared and golden, on a bed of seaweed salad, with a grapefruit segment, baby brussels sprouts, and haricot vert, and beurre blanc sauce. What I loved about this course was the wonderful balance of salty and sweet, how the citrus complemented the scallops, and worked well with the combination of the slight bitterness of the brussels sprouts. 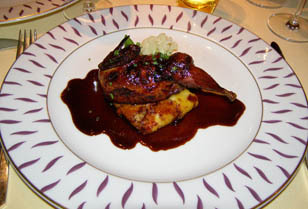 The last of Edward's savory courses was a delectable quail from Vermont in a devil sauce made with white Armagnac and crushed black pepper (grosse caille élevée pour nous par la ferme Cavendish du Vermont) that was culinary perfection. I continued with medallions of monkfish with pearl onions and Parisian carrots presented in a heavenly lobster and red wine sauce (médallion de lotte et carrottes boules) that was the perfect finale to my savory courses. The wine for our fourth course was Clos des Menuts 2004, Saint-Émilion Grand Cru, Famille Rivière, 13% alcohol, from the Bordeaux region that was made with a blend of 85% Merlot, 10% Cabernet Sauvignon, and 5% Cabernet Franc. 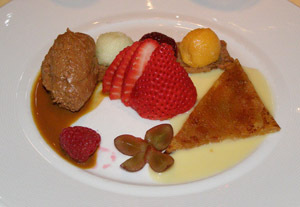 Dessert took a lighter approach with an apple tart, a quenelle of chocolate mousse, and a selection of three sorbets that were well paired with Chateau La Foncalpre 2006, Monbazillac, 14%, France, which had a lovely aromatic nose and a delightful yet not overpowering sweetness. A plate of mignardises consisting of macaroons, quince paste, and butter cookies were the final sweet parting to an evening to remember at Restaurant Jean-Louis. 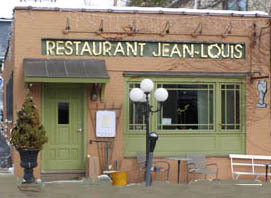 Restaurant JEAN-LOUIS is open for lunch Monday through Friday from Noon until 2:00 pm, and for dinner Monday through Saturday from 5:45 pm. Read the Chefs' Recipes section where Chef Jean-Louis Gerin shares a delicious taste of Restaurant Jean-Louis to tempt your palate before visiting the restaurant. Read other articles on Stamford, Connecticut and the surrounding area in the Destinations, Hotels and Resorts, Restaurants, Chefs' Recipes, and Arts sections. © March 2010. Luxury Experience. www.LuxuryExperience.com All rights reserved.